•Select Scan Job: Select a Scan Jobs from the drop down list. To add or edit a scan job, click on the Edit Jobs button on the ribbon. 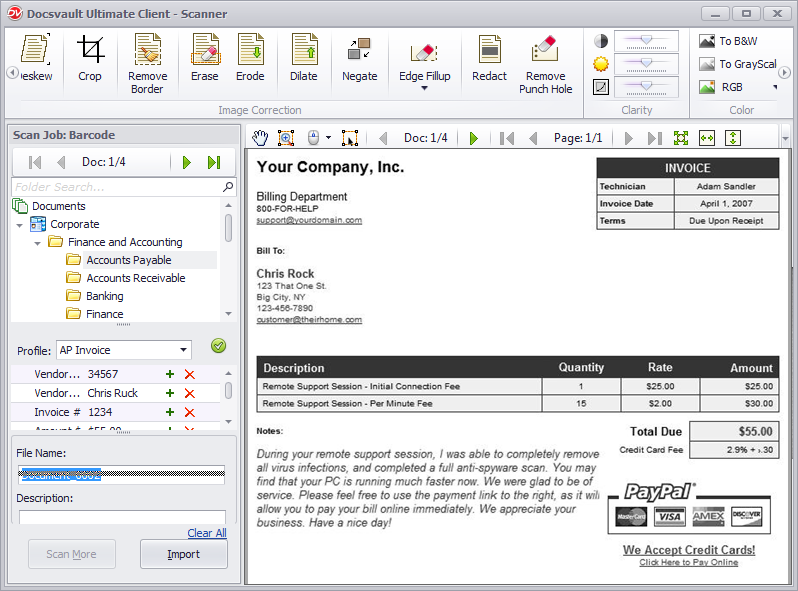 The name of the appropriate scan job appears on the toolbar below the Ribbon, and its settings are automatically associated with the current job. The selection remains active until you change it again. •Click Scan button to scan the document. As pages are scanned, the pages are displayed in the viewer. You can have better vision of the scanned pages by selecting Page view from the ribbon to view one page at a time, or Thumbnail view to view all the pages at once. In either view, you can use the slider in the bar below ribbon to adjust the magnification of pages. In the viewer, you can see each page, merge, split, delete or reshuffle the pages, add annotation by highlighting and improve the quality of scanned pages such as despeckle, eraser, crop, brightness, contrast, erode, dilate, etc. before importing the scanned file into Docsvault. The predefined scan jobs automatically apply the image quality settings. If you decide to adjust pages after scanning, you can use the options from the toolbar. The availability of controls on the ribbon may vary, according to the view (thumbnail or Page view) that is active. •Click the button associated with the adjustment that you want to make to apply to the image. For more information see Page view ribbon. In Thumbnail view, you can select multiple images and apply operations like merge, split, reorder pages, etc. before saving the scanned files. For more information, see Thumbnail view ribbon. •Docsvault only recognizes machine-printed characters such as laser-printed or typewritten text. However, it can retain handwritten text, such as a signature, as a graphic. Depending on the settings of Doc. 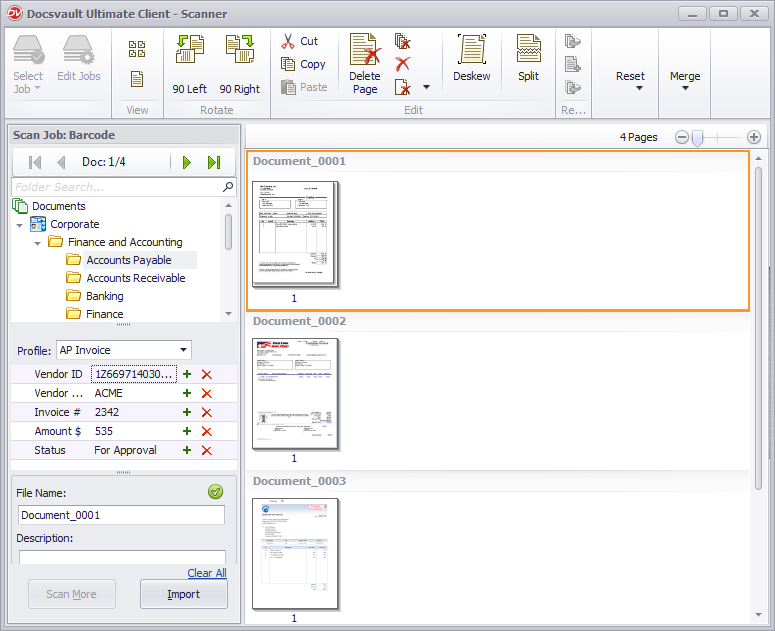 Separator, scanned pages would be scanned as a single file or multiple files. •Select the destination where you want to save the scanned document in Docsvault. If the selected Scan Job is set with a 'Profile Based Auto Filing' then documents are directly saved at the location as configured in the job. For more information see Filing Rules. •Select an appropriate document profile from the 'Profile' drop down OR You can use Rubber-Band OCR tool to quickly populate text in all meta-data fields (e.g. file name, file description, index fields). For more information, see Rubber-Band OCR. If in the selected Scan Job, barcodes are mapped with index fields then on selecting the appropriate profile the index fields will be automatically populated with the barcode values. For more information see Barcodes. •Enter a File Name in case the auto file name option is not set in scan job setting. For more information see Filing Rules. •Select the Folder Sections under which you want to save the file. For more information see Folder Sections. •Apply to All Files, clicking on this button will apply the above setting to all the pages. •Clicking on Import button will save and import the scan pages in Docsvault. •You can save a scanned document in TIFF, PDF, JPG, PNG or BMP format. 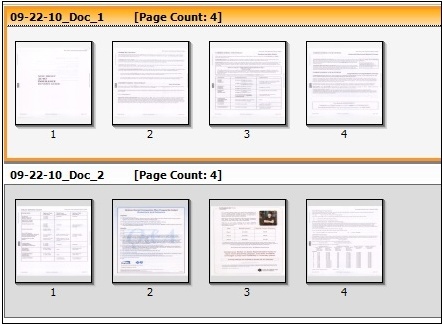 •Document quality and the selection of scanning options greatly affect the quality of OCR. •The OCR process is independent of the scanning process. You can configure Docsvault to OCR the scanned document at the later stage by disabling the OCR service from Docsvault Server Manager > OCR node. When the OCR service is enabled, it will OCR all the PDF files marked for OCR while scanning and will convert it into searchable files. •At times, maybe you want to send a scanned image to someone strictly as an image, without converting any text or, maybe you are scanning text-free photographs or artwork. You can unselect the OCR option while scanning. At the later stage, you can apply for OCR to PDF, see Re-OCR PDF file.